Nestled in the lush rainforest of Virgin Bay in Ellamar a turn of the century copper mining town Prince William Sound Lodge combines fascinating history, gourmet meals and outstanding coastal paddling, day hikes and beach-combing. Visit sea otter pupping grounds, observe a spectacular variety of birds, and frequently humpback and orca whales cruising past Ellamar. All make a visit to PWS Lodge an experience to be remembered for a lifetime. Add a little more adventure! After a third night at the lodge and a leisurely breakfast, our water taxi will pick you up to paddle the outside of Glacier Island. 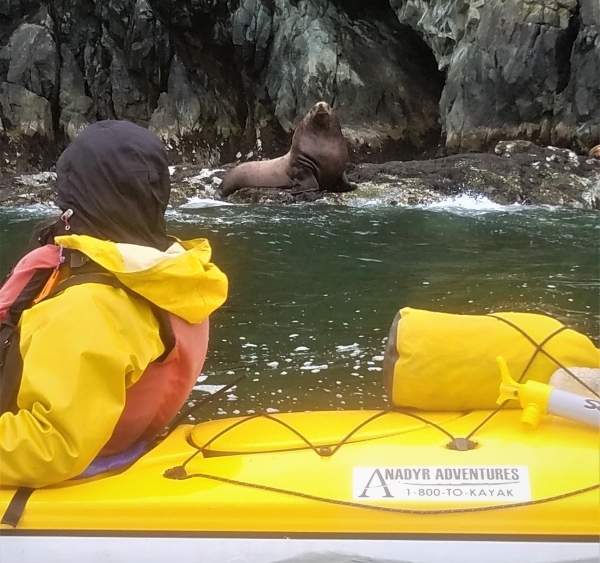 Paddle with sea lions, explore sea caves with nesting puffins and cormorants. The exposure of the outside of Glacier Island to the Gulf of Alaska has created some of the most spectacular sea caves on the Alaska coast. This trip goes through our most likely area to see humpback whales, Dahl porpoises and orcas. We lunch at Whale Rider beach keeping a sharp eye out for krill foraging humpbacks. And while you are there the guide will tell you why it’s called Whale Rider beach! At the end of the day the water taxi will take you back to Valdez in time to catch the evening flight out of town. Paddle the Columbia Glacier icefield on Day 1. Then, spend the next 2 Days exploring the Tatitlek Narrows shoreline and the turn of the century mining town Ellemar on this 3 Day 2 night pampered adventure. Anadyr Adventures offers mother ship supported two to ten day kayaking tours to remote and spectacular parts of Prince William Sound. As our guests, you have the choice of staying on board one of our comfortable sailing or motor yachts. We visit fjords with majestic tidewater glaciers and spend time in hidden bays and protected passages. You have the choice of kayaking, walking, hiking, sailing, wildlife viewing, beachcombing, fishing, or simply relaxing on board and enjoying the scenery. The vessel will cross all open waters taking you from spot to spot in the morning or evening allowing you to set your own pace with more time for activities and relaxation. We provide warm comfortable sleeping quarters, hot showers, delicious meals, all the necessary kayaking snd safety equipment, profesional guides, licensed captain, and a motorized skiff for safety and on shore activities. All you need to bring are your clothes, camera, and the willingness to share an unforgettable experience. Our trips are designed to accommodate from four to six guests and range from 2 days to 2 weeks. The itinerary changes according to your particular interests, the number of days on board, the weather conditions, and the ability of our kayaking guests. Mothership trips are the ideal choice for novice kayakers, anniversary and honeymoon couples, families with smaller children, groups with diverse interests, and for everyone who prefers traveling in comfort of a small groups, flexible itinerary, personalized service and a warm shower at the end of each day. We use several different motor vessels for these trips depending on your group size and the level of service you’d like. Prices may vary depending on the boat. To learn more about our mothership trips please call ANADYR ADVENTURES in Valdez toll free at 800TOKAYAK. Two sailing vessels are available for mothership based kayaking tours. Each boat is 50 ft long and can comfortably accommodate up to 4 guests. The vessels cruise at 8 to 9 knots per hour allowing you time for sailing, wildlife watching and relaxation. Kayak in front of Shoup Glacier than explore Sawmill Bay and the secluded bays around Glacier Island, visit puffin and Steller sea lion rookeries, hike, pick blueberries and salmon berries, and enjoy the magnificent scenery of Columbia Glacier from atop Glacier Island. And, if time allows paddle through the beautiful and rarely visited Long Bay. Extend your stay for two more days and also explore explore Long Bay, Tatetlick Narrows for the best viewing of sea otter nursing grounds. Visit historic Ellamar and kayak to the lagoon at the head of Galena Bay. Adjustment in rates will be made for groups with less than 4 guests.